Join the 10,000+ Happy Smiles Transformed with Braces at McDade Orthodontics! Dr. McDade is our 5-star-rated orthodontist for hidden braces in Oxnard, CA, Camarillo, CA, and Santa Barbara, CA. Incognito™ braces are placed behind your teeth making them virtually undetectable to your friends and loved ones! Braces behind your teeth are created using state-of-the-art technology and are the only 100% customizable, invisible, fixed-type of braces on the market today. 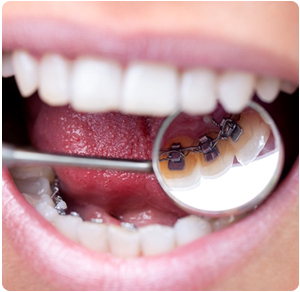 Braces behind your teeth gives you a beautiful smile, even during orthodontic treatment! Incognito braces can be worn by both teens and adults. Orthodontist Dr. McDade understands that every mouth is unique; this is why braces behind your teeth are specially designed to fit the unique structure of your mouth. You will experience the highest quality treatment and a more radiant smile! If you are looking for a more discreet type of braces, schedule your McDade Smile Consultation today! Schedule Your Free, No-Obligation Smile Consultation for Hidden Braces in Oxnard, CA, Camarillo, CA or Santa Barbara, CA, Today! Join the over 10,000 happy smiles transformed at McDade Orthodontics! Call 805.485.3200 to schedule your free, no-obligation smile consultation with our 5-star-rated orthodontist for hidden braces in Oxnard, CA, Camarillo, CA or Santa Barbara, CA. To request your consultation online, click here.